Farming leaders across the UK have warned that the industry must not be sacrificed in order to meet greenhouse gas (GHG) reduction targets in the wake of the latest report from the Committee on Climate Change. In its latest publication, Reducing UK emissions – 2018 Progress Report to Parliament, amongst other things, the Committee warned that large reductions in emissions from power generation had masked a lack of progress in other sectors, including agriculture, and that the sector now accounted for 10 per cent of total UK GHG emissions. Excluding transport, agricultural greenhouse gas emissions were 46.5 MtCO2e in 2016, broadly unchanged from 2015. Emissions are 16 per cent lower than in 1990, but there has been no progress in reducing emissions in this sector since 2008. Around half come from livestock, and a quarter from soil management, with the rest coming from manure management and machinery. The post New emissions targets could cripple farming appeared first on Hort News on 9 July 2018. This entry was posted in HortNews and tagged Committee on Climate Change, emissions on 25 July 2018 by Richard. Farm business advisors at Strutt & Parker have warned UK farmers to continue to be aware of proposed changes to the Common Agricultural Policy (CAP) even as the UK prepares for Brexit. In terms of funding, direct payments will be capped at €100,000 (£87,000) and payments above €60,000 will be subject to regression reductions. Overall the budget for Pillar 1 payments will see an 11 per cent reduction in real terms, while Pillar 2 will see a cut of 27 per cent. The post British farmers need to keep up to speed on CAP reform appeared first on Hort News on 9 July 2018. This entry was posted in HortNews and tagged Brexit, Common Agricultural Policy on 25 July 2018 by Richard. Farmer suppliers to the Co-op have planted more than 1,000 miles of hedgerows to form part of a network of ‘bee’ roads across the UK. The post Co-op suppliers set up ‘bee roads’ appeared first on Hort News on 21 June 2018. This entry was posted in HortNews and tagged bees, Co-op, pollinators on 23 July 2018 by Richard. Huntapac Managing Director Warren Hunter and Technical Director Stephen Shields plan to cycle from Land’s End to John O’Groats in just two weeks from the 5 July to raise money for a number of good causes including local children’s hospice Derian House, Lupus UK, Mere Brow and District Institute, and a little girl with a genetic disease. The post Huntapac Bike Ride for Charity appeared first on Hort News on 20 June 2018. This entry was posted in HortNews and tagged charity, Huntapac on 23 July 2018 by Richard. 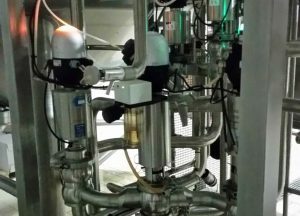 A key challenge in the food industry is recovering valuable product which is left in equipment and pipework after production runs, for example between product change-overs and before cleaning. Product lost in this way increases operating costs unnecessarily and affects beverage manufactures to sauce producers, fruit and vegetable purées, and many other products. Companies often use ‘pigging’ systems to remove such retained product, particularly in the last portions of their production process. Some of these systems are very simple, while others can be very complex. The pigging device physically recovers material from the system and is often an integral part of CIP (Cleaning in Place) cycles. Other alternatives are to use water or clean air to ‘push’ the product through the system until such time as the product is either too diluted or the product seal in the pipework is broken. All three of these approaches will salvage some residual product, but a certain amount of usable product will inevitably be lost as waste. However, by using inline measurement and automatic control, you can guarantee that the maximum amount of product possible is recovered from pasteurisers and sterilisers in the production line. The concept of a feedback loop to continually measure and control a process is well established in automated food production. For example, every HRS pasteuriser or steriliser has a temperature transmitter and a three-way valve installed after the holding tube. If, for any reason, the set pasteurisation or sterilisation temperature is not maintained in the holding tube, the temperature transmitter sends a signal to the valve to return the product back to the holding tank. This prevents any product that may not have been adequately pasteurised or sterilised entering the food chain and allows products to be recovered and reworked if appropriate. The same principle can be applied to universal product recovery, measuring different parameters. If we imaging a fruit juice production line, an inline Brix meter positioned after the pasteuriser can monitor the sugar concentration against a target level of 12 oBx (the set point). When the concentration falls below the set point, a controller diverts the remaining product away from the filler. Such an approach overcomes any doubts about where the ‘mixing zone’ may begin when water is used to push product through the system as it can be accurately measured in situ. In addition to maximising product recovery, the waste being produced will be cleaner (as there is less product in it), potentially reducing disposal or treatment costs. In the previous example we have used an inline Brix meter to measure sugar concentration, but it is possible to use a suitable device to measure any physical property (pH, viscosity, density) depending on the best criteria for the product. For example, a US manufacturer of BBQ sauces makes a profit of $2 on every gallon of sauce produced. If the company loses 100 gallons of sauce per day, profits decrease by $200 per day. Based on 300 days of production a year, this equals $60,000 dollars a year. If this was repeated across four production lines the company could be losing almost a quarter million dollars ($240,000), not to mention the costs of treating and disposing of the wasted product. Even a 50% reduction on waste across all lines would save $120,000 a year, covering the costs for the installation of a system. These examples have focused on the end-of-run condition for processing. However, this system also helps reduce product loss on start-up. For example, if a production line is ‘warmed up’ with water, the water is typically ‘pushed’ out by the product until a certain condition is reached. This system accurately establishes when that point occurs, eliminating the guesswork and automatically saving even more usable product each run. This type of system can be installed with any existing system (pasteuriser, steriliser, hot filling) with very little downtime. Real world payback times will depend on the quality of the instrument used and the value of the product, but average payback periods are between 1 and 6 months. In addition to improving bottom line profits, there are also environmental benefits. Recovering more product saves on energy required to process waste streams, reducing waste and lowering the carbon footprint. HRS Heat Exchangers have successfully installed several of these systems in plants around the world, helping clients choose the right instrumentation and the correct software for the system. If you have a project that involves product recovery or you are interested in learning more, please contact us. This entry was posted in Copywriting and tagged HRS Heat Exchangers, pasteurisation, product recovery, sterilisation on 23 July 2018 by Richard. British Flowers week begins on 18 June and this year is supported by the Flower Market at New Covent Garden Market, Flowers from the Farm and the British Florist Association. 2018 marks the sixth year of the campaign, and events to celebrate the UK cut flower industry include a Farmer Florist exhibition at Ryedale Folk Museum in North Yorkshire, a ‘flower bomb’ of British blooms in Edinburgh’s Old Town, and six innovative installations at the Garden Museum. Started by New Covent Garden Flower Market in 2013, British Flowers Week is an annual celebration of the wealth and variety of British cut flowers and foliage. Last year’s campaign saw over 35 British Flowers Week workshops, talks, pop-up shops and floral demonstrations taking place around the country. This year tools for florists include free gift tags and posters, as well as using the hashtag #BritishFlowersWeek to connect on social media channels. The post Industry prepares for British Flowers Week appeared first on Hort News on 14 June 2018. This entry was posted in HortNews and tagged cut flowers, New Covent Garden on 13 July 2018 by Richard.